Canada will slap larger and enhanced warning labels on cigarette packs, the government announced on Thursday, in a step critics said was unduly delayed because of lobbying by tobacco companies. Health Minister Leona Aglukkaq said the new warnings will cover three-quarters of the front and back of cigarette packs, up from one-half. "Canadian and international research has shown that to be effective, health warnings must be noticeable and memorable. They must also be believable and relevant," Aglukkaq told reporters. Ottawa will begin drafting regulations for the new warning labels in early 2011, but has no specific timeline for implementation. Tobacco companies will have a chance to comment during the process and the new rules will be phased in gradually, officials said. In September of this year, the Conservative government confounded anti-smoking activists by freezing plans to update the warning labels after the health ministry spent six years devising the new campaign and agreeing on details with the country's 10 provinces, which administer public health care. The policy change issued on Thursday prompted the main opposition Liberal Party, to accuse the government of flip-flopping after realizing its stance was unpopular. "Only public uproar over the influence of the tobacco lobby has forced them to change course and so here they are with a hasty announcement designed to cover their tracks buried in the holiday season," said Liberal legislator Ujjal Dosanjh. "Today's announcement is long overdue and suggests the tobacco lobby continues to have a tight grip on this government," he said. Aglukkaq denied she had met with tobacco companies and said it took time to prepare a comprehensive package of anti-smoking measures, which include targeting young smokers through social media like Facebook and setting up the phone line for quitters. The graphic warnings will also change periodically to remain fresh and noticeable. Canada was considered a world leader when it first put warning labels on the front of cigarette packs in 2001 but failure to upgrade has since led it to lag behind others. A 2009 survey showed 18 percent of Canadians smoke. The rate rises to 23 percent for young adults aged 20-24. Some 37,000 Canadians die every year from tobacco use, Aglukkaq said. Major producers of tobacco sold in Canada include R.J. Reynolds Tobacco Co, Japan Tobacco's JTI-Macdonald unit, Rothmans Benson & Hedges Inc, which is partly owned by Philip Morris, and Imperial Tobacco Canada Ltd, a unit of British American Tobacco. Imperial said the government was ignoring the larger problem of cigarettes being illegally smuggled into Canada to avoid taxes that are kept high to discourage smoking. "This announcement is simply poor policy for political gain and has little to do with its stated health objectives," John Clayton, a company spokesman, said in a written statement. But Rob Cunningham, a senior analyst at for the Canadian Cancer Society, said the new plan sets a example that should be followed by other countries. One of the labels will feature an image of well-known Canadian lung cancer victim Barb Tarbox on her deathbed accompanied by the message: "This is what dying of cancer looks like." 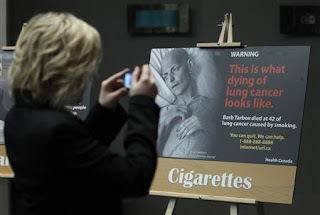 The family of Tarbox, a former model who campaigned against smoking before she died in 2003, has said one of her last wishes was that her picture be used as a warning label.